The Canadian Alliance to End Homelessness appeared before the House of Commons Standing Committee on Veterans Affairs today and this is what we had to say about preventing and ending veteran homelessness: it can be done! Good afternoon everyone. Thank you for this opportunity. I’m pleased to be speaking to you from the traditional territories of the people of the Treaty 7 region in Southern Alberta. The City of Calgary is also home to Métis Nation of Alberta, Region III. I’m here in my capacity as President & CEO of the Canadian Alliance to End Homelessness with expertise in preventing and ending homelessness including experience developing housing programs for homeless veterans. I also served just over six years in the Canadian Forces and am a Veterans Affairs client myself. All this to say, this issue is close to my heart and I’m thrilled to be here and am glad you’re studying this important issue. I have two main messages for you. The first is that veteran homelessness is readily solvable. The number of homeless veterans in Canada is relatively small, we know what to do and how to do it. Our American friends have cut veteran homelessness in half over the last eight years and there are eight U.S. cities that have ended veteran homelessness altogether. To put the scale of this achievement in perspective, there are approximately 37,500 American veterans homeless on any given night now, compared with all Canadian homelessness at about 35,000 people per night. I believe with a focused effort and a sense of urgency, veteran homelessness in Canada could be eliminated in three years or less. My second message is that we know what to do – we have strong veteran networks, solid expertise in communities, proven models to follow and would have strong public support – what’s missing is federal leadership and decisive action. We need a federal government prepared to make a clear and unequivocal commitment to ending veteran homelessness and willing to invest the modest additional resources needed to get the job done. So, what would it take to end veteran homelessness in Canada? Here are five things I think are essential. First off – prevention. We have to stop the flow of veterans into homelessness. 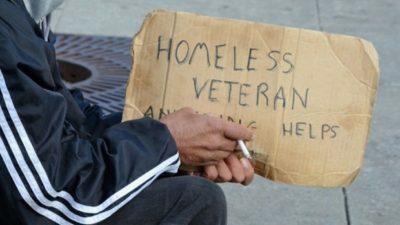 There are tools being developed to assess veterans for risk of homelessness including some excellent work being done in the United States right now by a gentleman named Dr. Dennis Culhane from the University of Pennsylvania who is the Research Director of the National Center on Homelessness Among Veterans for the U.S. Department of Veterans Affairs. If we understand who is at highest risk of homelessness, and we understand a veteran’s pathway into homelessness then we can intervene well before homelessness occurs. Second – borrowing the old military axiom ‘time spent in reconnaissance is seldom wasted – solving homelessness requires actionable, real-time, person specific data on everyone experiencing homelessness. We can’t gather the necessary information to house homeless veterans solely by counting them anonymously once every two years or having information collected by a handful of agencies or Veterans Affairs – we have to document the names and unique needs of every veteran experiencing homelessness, have an ability to share that information among those in the community who can house and support them, monitor performance, notice fluctuations, identify problems and respond in real time. This approach to homelessness data is being wired into the new federal homelessness strategy Reaching Home which will launch in April. As of today, there are already 11 Canadian cities* with Quality By-Name Lists on chronic homelessness and another 23 actively working toward it. Third – pay the rent. The critical policy gap in our federal response to veteran homelessness is the absence of a veteran rent supplement program. We should carve out of the new Canada Housing Benefit a federally administered Veteran Housing Benefit, modelled on the HUD VASH voucher in the US. Any person meeting the VAC definition of veteran – meaning anyone who has completed basic training and has been honourably discharged – should be eligible. This would be a powerful homelessness prevention tool and an efficient, highly cost-effective way to move veterans directly off the streets and into housing. Fourth – use Housing First. Housing First is a recovery-oriented approach to ending homelessness that centers on quickly moving people experiencing homelessness into independent and permanent housing and then providing additional supports and services as needed. Housing First is an evidence-based approach that has been proven to work with homeless veterans and is at the heart of every successful effort to prevent and reduce homelessness. Finally – partner with local homeless systems and veterans service organizations. I think Veterans Affairs should stick to what they’re good at and partner with local organizations to do the housing and work with veterans’ service organizations and others to provide outreach and support. The federal government already has the community-based infrastructure through the Homelessness Partnering Strategy in Employment and Social Development (the new Reaching Home). Use that infrastructure and presence in 61 communities in every province and territory. Ending veteran homelessness will require an additional investment in those communities – in housing, supports and coordination – but the infrastructure is there and there’s an opportunity to leverage provincial and community resources. I’ll wrap up where I began. Veteran homelessness in Canada is readily solvable. We know what to do and how to do it. We have strong veteran networks, solid expertise in communities, the federal infrastructure in place and proven models to follow – all that’s missing is federal leadership and decisive action. We have a duty to these men and women. Let’s get on with it. 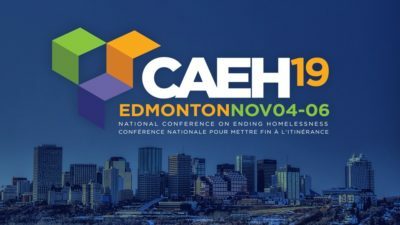 By now you’ve probably heard that #CAEH19 is happening in Edmonton next November 4th to 6th. Be sure to check out this welcome video from Edmonton Mayor Don Iveson. In early January we’ll be updating our website with more information including how to become a sponsor, our call for presentations and information on scholarships for next year’s National Conference on Ending Homelessness! We’ll be posting presentations and keynote speaker videos from #CAEH18 to our conference website shortly. For now, check out our photo galleries from Day One and Days Two and Three.